References to Watergate are flying thick and fast — again. 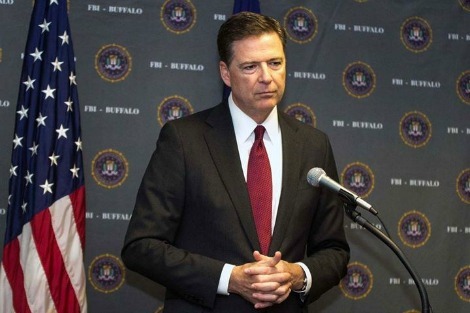 Earlier this week, US President Donald Trump abruptly dismissed FBI director James Comey in the middle of a probe into Russian interference in the 2016 elections. It is difficult to overstate how bad this move is, and how much it has rattled political and bureaucratic firmaments. Richard Nixon feels like a natural comparison, given the similarities around an intransigent executive intent on sabotaging the gears of accountability. In 1973 Nixon fired the independent special prosecutor Archibald Cox, who was tasked with investigating the break-in at the Democratic National Committee offices. Cox had refused to compromise on a subpoena for Oval Office recordings; he was fired on a Saturday. Then as now, an official overseeing an investigation that bears impact on the White House was removed — just as the investigation intensified. Comey had recently started receiving daily briefings rather than weekly, with the Wall Street Journal reporting that he was disturbed by 'potential evidence of collusion'. Days before he found out from a TV screen that he had lost his job (he thought it was a prank), he had asked for more funding and personnel for the investigation into the links between the Trump campaign and Russian elements. There are differences, however, between then and now. Trump is not Nixon, for one thing. Perhaps we can be thankful for that, in that infantile impetuosity is not paired with a much more cunning mind. Trump has made a habit of lobbing own goals, mostly via Twitter. The people around him don't seem much more competent. His administration's attempts to dampen or derail the search for truth about contacts with Moscow will continue to backfire, including the Comey dismissal. FBI directors of course serve at the behest of the president; Comey does not imagine himself a martyr, and nor should we. But the self-involved rage and contempt involved in the President's decision are not likely playing well across the national security apparatus. No president can afford an adversarial relationship with it. It will only provide further incentive for whistleblowers and leakers. How else must the truth emerge if the executive branch, as well as the Republican legislators, will not leave unimpeded the search for facts? Yet for Trump, politically embarrassing leaks against his administration are the foremost security issue, not the questions that they raise about potentially criminal conduct involving those in his orbit and even himself. "Firing the FBI director isn't just about optics or timing. There is no good look to be had, and no timing that could be better, as long as these investigations are live." The other difference between then and now is that Watergate was domestic in context, and at least initially a case of partisan political chicanery. The multiple investigations of Russian interference and/or links to individuals in the Trump campaign — at the FBI, in the Senate, and the Justice Department — traverse different ground. They touch on possible collusion with or introduction of foreign elements into the democratic process, testing the US constitution in interesting ways. It is unusual for impeachment to be ongoing fodder for earnest commentary this early in a presidency, or for obstruction of justice to be only the latest reason that experts have offered as basis. It captures, most of all, present American vulnerabilities. There may be three branches of government, but Trump has demonstrated how loose executive powers can jeopardise the checks and balances built into the system. Firing the FBI director isn't just about optics or timing. There is no good look to be had, and no timing that could be better, as long as these investigations are live. Yet that seems to be the prevailing concern for Republicans. As always, the lens is political rather than ethical or moral. What worries them is the impact on the mid-terms next year. It points to another difference between then and now, though there is plenty of room for development. Six Republicans joined 21 Democrats of the 38-member House Judiciary Committee to move to impeach Nixon. From now on, it is a numbers game. The secretive closed Nixon and the flamboyant outspoken Trump present different personality traits. Their common traits are much more persuasive though. Both men attained the highest political office in the most powerful country on earth. Nixon through a long career in politics and Trump through already attained power and wealth combined with an on-song message, however repugnant, for Americans. Trump's explanation for firing Comey "He wasn't doing his job" is enough explanation for a powerful man. Or is it? “Infantile impetuosity is not paired with a much more cunning mind”. Both can lead to untold harm. “ Loose executive powers can jeopardise the checks and balance built into the system“. From a bad situation, there is usually no ideal solution. The most that can be hoped for is that lessons are learnt and the proper infrastructure put in place to forestall damage and to allow appropriate development for the future. "the lens is political rather than ethical or moral" "attempts to dampen or derail the search for truth." This post was about American vulnerabilities but the same principles apply to Christianity. but that is another story, not welcome yet by stubborn ‘traditionalists. It was reported in the New York Times that Comey asked for more resources from the Department of Justice, but there was no source named. The DOJ Director of Public Affairs Sarah Isgur Flores said that this report was false - there was no such request. Most reports now cite the NYT report and the Flores denial, leaving it up to people to believe what they want to believe. You can believe if it suits you that the NYT report was true and what Flores said was false, but it should not be stated as fact that Comey asked for more resources. Damien: " You can believe if it suits you." One of the problems with the current use of weasel words, and partial truths is that as a last resort people have no option than to be selective in what they believe. In this case, there may have been an informal enquiry about more funds, and the denial was that there was no 'formal request". There is a very old saying being popularised by politician; "The best lie is the Truth." Not the whole Truth, but a carefully selected part of the Truth, chosen to obscure the full truth, and to deceive as many as possible, so as to gain some advantage. "Infantile impetuosity is not paired with a much more cunning mind..." could be said to be somewhat wide of the mark given the combination of Trump and his shadow, Bannon. Little notice has been given of late to the latter in the daily media but serious opinion and commentary has not been quite so silent. The combination remains of concern.